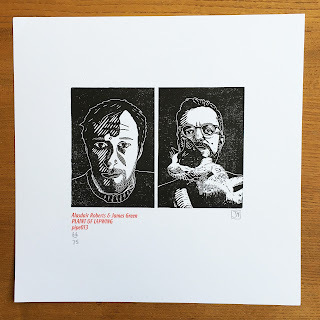 Clay Pipe Music: 'Plaint of Lapwing' by Alasdair Roberts and James Green. 'Plaint of Lapwing' by Alasdair Roberts and James Green. Clay Pipe Music is proud to present 'Plaint of Lapwing' by Alasdair Roberts and James Green. 12" vinyl with download slip. 500 copies in red, 300 copies in blue. Hand numbered reverse board covers. Mayday 2012: an email from James Green in Sheffield reached me in Glasgow. I knew James a little – not particularly well; we had met a few times over the years and had collaborated a little too (I'd sung on a couple of songs on the album Folk Songs 2 by his group The Big Eyes Family Players). I understood that he played the harmoniflute, an instrument somewhere between a harmonium and an accordion, and seemed very enamoured of it. His email read: “had an idea about approaching you with... an ep or few songs (trad or otherwise) accompanied by my harmoniflute, and nothing else... just an idea once the dust has settled, maybe...”. The dust was not long in the swirling before coming to rest upon both of our past endeavours, and shortly we set to work on the project which became Plaint of Lapwing. My initial thought was to concentrate on just four pieces – I'd just recorded the Drag City LP/CD A Wonder Working Stone and had some songs left over from that. In a process which James was later to characterise as 'surreal', I started emailing him recordings of my disembodied voice; in response I would eagerly await, tracks featuring aforesaid voice with James' harmoniflute accompaniment. The project gradually, almost imperceptibly, developed in scope and complexity over two years. I began sending James more vocal takes as well as other sonics I'd generated, for a variety of original compositions and some by other authors (including a song by the Perthshire folklorist Hamish Henderson, an arrangement by Benjamin Britten of a piece by the Irish poet Thomas Moore, a lyric by beekeeping Cornish film maker Timothy Neat and a setting of a work by the Angus poet Violet Jacob). James in turn increased his instrumental palette to include drums, guitars and all other kinds of musical things. As the project developed, so did a wonderful friendship blossom between James and myself. I found I was sending vocal tracks attached to emails detailing current grievances in my personal life, as if envisaging James as some kind of agony aunt. James, in return, sent completed tracks and, apparently regarding me as some kind of sounding board, emails venting his strident opinions (invariably in line with my own) on whatever political matter ruled the day. Before we knew it the disembodied sounds had become incarnate and James and I found we had an LP's worth of material - an LP featuring beautiful artwork by Frances Castle which you, dear listener, now have the opportunity to welcome into your own home. Lino print by James Green.